However for those of you LightScribe fans who love the LightScribe Template Labeler but are frustrated by the lack of flexibility of the software – I have something for you! For you guys who have duplicators that run the LightScribe Template Labeler software but need a better solution that the templates provided – I have something for you too! If you did not know, all LightScribe Duplicators use LightScribe’s proprietary .lsi files and the ONLY software in existence that uses this file format is, LightScribe’s own Template Labeler, or at least the version created for duplicators. I have been working with LightScribe for over 7 years and during that time (at least since the Template labeler was released by LightScribe) I have been asked by people who have duplicators if I had a solution to the issue of the lack of features that the software had. Over 3 years ago I made it my mission to ‘reverse engineer’ the software to find a way people could use it to create ANY LightScribe label they wanted and not be limited to the templates that LightScribe provide. 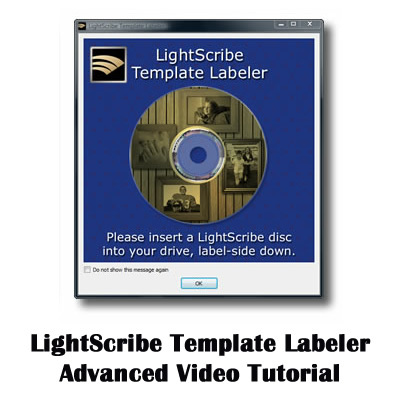 I hope this LightScribe Template Labeler Video Tutorial helps you get the most from the Template Labeler. Go here >> LightScribe Tutorial Videos to see my other Free LightScribe videos.